This is a recipe created a little over two years ago in celebration of the dear wife’s birthday. She has a passion for desserts, and at one time could recite the desserts for which their reputation stood on restaurants fame in New Orleans, and made them popular. Now that memories are fading, newfound fame is upon us as we attempt to create a new taste sensation. 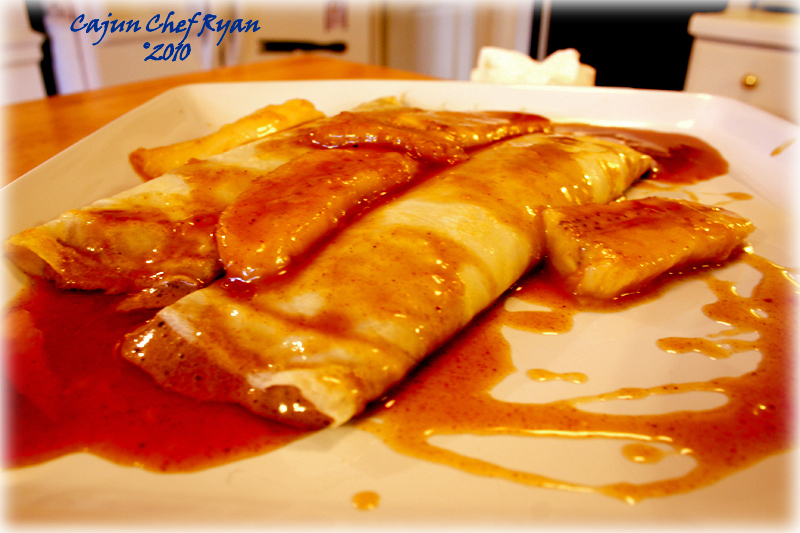 This dessert is completely made from scratch, the crepes, the chocolate mocha custard (or Bavarian Cream variation), and the bananas foster sauce. All combine for a sweetness and flavor explosion not seen in these parts for some time. Fair warning, this recipe takes a bit of skill, and would say is on the advanced end of the culinary scale. Making the thin French pancake style crêpes from scratch takes some skill, but with practice this is one of those “aha” moments and skills that you never forget once you have mastered the technique. With all the individual recipes shown first, and then the final finishing technique presented at the end. TIP: You will need an electric blender for preparing the batter. Should you be without an electric blender, a manual mixing method will work just fine, but you will want to put the flour into a large bowl first, and then gradually work in the egg yolks with a wooden spoon. Then beat in the liquid ingredients a little at a time until all incorporated. The final step for the manual mixing method is to strain the batter to remove any lumps, insuring a smooth batter. This recipe will yield about 18 to 20 crêpes, 6-inches in diameter. You must know and prepare ahead of time, once the batter is prepared it should be covered and refrigerated for at least 2 hours, and preferably overnight before actually making the crêpes. The flour measurement in the crêpe recipe is a leveled cup. This means you scoop the flour with a 1-cup measure, and then use the back of a knife to level out the flour. Grand Marnier orange flavored liquor is in this recipe, however, you can use any rum or brandy. Once made, the crêpes can be refrigerated for several days, or frozen for up to several months. Reserve the two egg whites from this recipe for use in the Bavarian Crème. 1. Place the ingredients in the bowl of a blender in the order listed starting with the milk and ending with the butter. 2. Cover and blend on the highest setting for at least 1 minute, or until smooth. If clumps of flour adhere to the sides, scrape them down with a rubber spatula and blend for several seconds more to incorporate. 3. Transfer to a small bowl and cover, then refrigerate for at least 2 hours or overnight. Have a sheet pan ready and at least six to eight sheets of wax paper ready before you start cooking the crêpes. Heat a 6-inch non-stick or coated sauté pan over a medium-high heat. Add a small amount of butter to just coat the pan, or spray it with a light coating of no-stick butter spray, allow the pan to heat the butter or coating. Ladle 1 fluid ounce of the crêpe batter into the middle of the sauté pan, immediately start turning the pan to coat the bottom with the batter until a thin pancake forms and the batter starts to cook. Continue to cook the crêpe until you hear a slight popping or sizzling sound. Turn the crêpe onto one side of the sheet pan that is covered with a sheet of wax paper. Place a sheet of wax paper over each layer of crêpes to keep them from sticking. Continue with step 2 through 4 to make up to 16 or 18 6-inch crêpes. Once completed with the entire crêpe making, cover them and refrigerate until ready for use. This recipe combines the custard made from semi-sweet chocolate and strong coffee with egg yolks and sugar custard. A variation offered for preparing a Bavarian Crème using whipped egg whites and additional whipped cream. Reserve the egg whites for use in the Bavarian Crème. The double boiler method employed here for making the chocolate mocha custard; however, a large stainless steel bowl covering a saucepot filled with hot water over a low flame will work also. Tempering the egg yolks first with a little of the hot chocolate/crème/coffee mixture will ensure that the custard will not break. The Bavarian Crème requires refrigeration for at least 6 hours or overnight, you will want to remember that when preparing this variation. 1. In the top of a double boiler, add the chocolate, heavy cream and 1 1/3 cups of the strong coffee. Heat over medium flame and melt the chocolate into the mixture until smooth. 2. Combine the cornstarch with the 2 tablespoons of cold strong coffee until a smooth paste forms. Add the paste mixture into the chocolate/cream/coffee mixture and stir well to incorporate. Continue to heat and cook for 8 minutes. Then cover and continue to cook for another 10 minutes. 3. Meanwhile, combine and beat together the egg yolks, whole egg, and the granulated sugar until smooth. 4. Pour a small amount of the hot chocolate/cream/coffee mixture into the egg mixture to temper. Then add the entire egg mixture into the chocolate/cream/coffee mixture and stir well to incorporate. 5. Continue to cook for 5 minutes in the double boiler and stir lightly. 6. Remove the custard from the double boiler and allow to cool until thickened. This is a three-step procedure, as we will be preparing the egg whites, and then preparing the whipped cream, and then adding them both to the chocolate mocha custard. Both of these two preparations combine with the cooled chocolate mocha custard to create the Chocolate Mocha Bavarian Crème. 1. Combine the reserved seven egg whites from the previous recipes and place them into the bowl of a mixer with a wire whip attachment. 2 Beat the egg whites with the salt until soft peaks form, then add the sugar and cream of tarter and continue to beat until stiff peaks form. 3. Using a rubber spatula, delicately fold the egg whites into the cooled chocolate mocha custard. 1. Beat the cream in the bowl of a mixer with a wire whip attachment until doubled in volume and the wire whip leaves faint traces through the surface of the whipped cream. 2. Using a rubber spatula fold the whipped cream into the custard and egg white mixture. 3. Transfer the Bavarian crème to a storage container, and cover, then refrigerate for 4 hours or overnight. This is one of those recipes that always just gets throw together when we want some quick foster sauce for ice cream, and I had to actually measure everything this time around so that it could be documented for your benefit and mine. 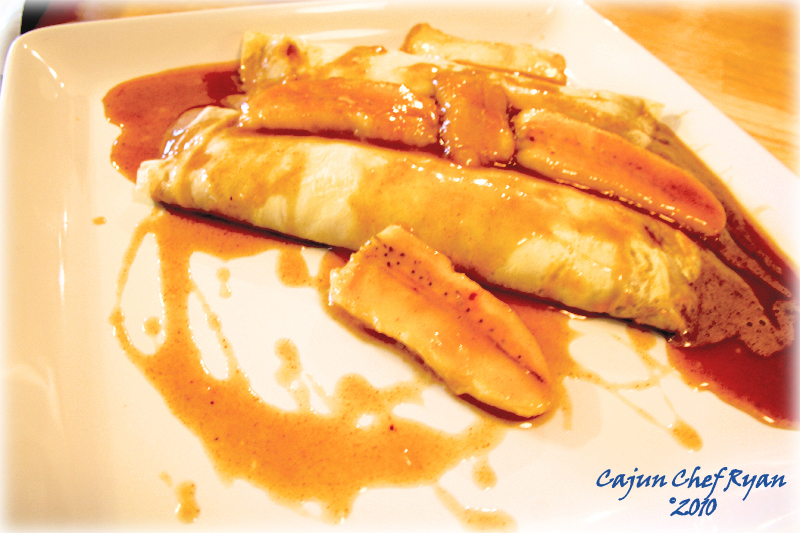 Once the crêpes are filled with the Chocolate Mocha Bavarian Crème then the Bananas Foster sauce can be made, it only takes about 10 minutes to prepare, so can be made at right before service. NOTE: Pour the liquors into a separate container and then slowly add them to the saucepan away from the flame, then add the pan back to the flame. If the liquors ignite, the flames will die down within a minute or so, be sure that no flammable material is near the pan. 1. Melt the butter in a large sauté pan over medium heat, and add the sugar to dissolve, stir well until smooth and bubbling. 2. Add the liquors and lemon juice and stir well, simmer for a minute or so, it will be bubbling. See note above on adding liquor to the pan. 3. Stir in the cinnamon, nutmeg, and salt, and then add the sliced bananas, continue to simmer until the bananas are soft. 4. Serve the sauce over the filled crêpes. To fill the crêpes you can use either a spoon or a pastry bag, ultimately you will be adding about 1 cup of the filling into each crêpe, and then rolling them up, and placing two filled crêpes on each plate for service. Take a crêpe and be sure that the cooked side is facing down on your cutting board or preparation table, then spoon or pipe one cup of the chocolate mocha filling onto the bottom 1/3 of the crepe, be sure to keep the filling on the lower 1/3 of the crêpe. Then lifting up the bottom edge of the crêpe from the side with the filling, gently roll the remaining crêpe over and around the filling, ensuring that no filling falls out and that the crêpe covers all of the filling. Gently transfer the crêpe to a serving plate. Do this for all the crêpes, placing two filled crêpes per plate. Once you are ready to serve, and actually, the crêpes can be filled ahead of service and chilled. When ready for service, just pour about ½ cup of the foster sauce with at least four banana slices over the top of the two crêpes and serve immediately. A few snaps of the plated creation! love crepes, specially with the above ingredients. oh my god! how delicious this is! Speechless speechless my sweet tooth just exploded…. Wow oh wow, the minute you said Crepe you had my attention. Wonderful post Ryan. That’s a great way to eat crepes! I have never made a crepe before. Do not own a crepe pan. But if it is on the menu, then I usually have it. It does require skill! Pure heaven. Absolutely beyond doubt that it has to taste like pure heaven. Hey everyone, thank you so much for the kind words. This is one that has been on the books for several years, we made it again and I just had to document it this time around. Glad to have shared it with you, it is a special treat, in honor of my dear wife! very nice! they look fab. def saving this one! Your crepes are superbe (spelled the French way). Our family always ate them as part of the Bastille Day celebration and we’d have a contest to see who could flip my mom’s crepe’s properly. Proper crepe creation is definitely an art (one I don’t possess….yet). What an amazing looking dessert.. however I think I’ll leave these kind of goods to the real chefs 🙂 I don’t know how well I’d do preparing crepes, but maybe I’ll give it a try! What a gorgeous dessert! Crepes are one of my favorite sweets, filled with anything, but these are over the top! What a wonderful creation in honor of her birthday! More chocolate! Chef Ryan…it is simply NOT fair to see these pictures and not be able to taste this! Oh my goodness…these just look incredible! When will they develop an app to allow tasting over the internet? This looks so good!